What does bus communication mean at D+H? Generally speaking, the term “bus” in information Technology refers to a system for transmitting data between multiple nodes in a network using a shared transmission path. Today, there are all different kinds of bus systems, such as in cars (CAN bus) or in smart homes (KNX, LON, BACnet etc.). In most cases, the most important nodes of a smoke extraction and ventilation network are a building management system, the window drives and, if necessary, the control panels. Protocols are used as transmission paths in order to meet therequirements for system-internal, secure and stable communication. These protocols can be transported both via Radio signal or via cable. Through the establishment of a common protocol, the individual devices can “talk with each other”, i.e. exchange information – in other words, “bus communication”. The Advanced Communication Network (ACN/AdComNet) is the first SHEV bus system certified by VdS. This technology allows SHEV controllers to be combined to form a single decentralised and overarching system. The controllers are linked in such a way that complex scenarios can be configured depending on space utilisation, i.e. individualised smoke compartments for opening and closing windows. The Advanced Communication Bus (ACB/AdComBus), by contrast, is based on the Modbus RTU protocol and regulates communication between controllers and drives rather than between controllers. ACB should therefore be understood as being an enhancement to AdComNet. For pure ventilation purposes, ACB drives can be operated directly from the building management system. For SHEV functions, the integration of a CPS-M – the digital SHEV control panel from D+H – is always necessary. More information about the planning of ACB drives can be found here. The new CPS-M SHEV control panel is already compatible with AdComNet and AdComBus without any additional components, making it perfect for complex SHEV and ventilation scenarios. The Modbus gateway is a universal gateway for connecting AdComNet to a Modbus network and has over 200 inputs and outputs. The connection module combines the SHEV controller with the AdComNet. And turns single systems into modular networks. The I/O module features an integrated trigger line to supply smoke detectors and SHEV control panels into the AdComNet. The DNB Bank bundles 20 of its locations at the headquarters in Oslo. The 17-storey building features extravagant architecture. The building's modular pixel structure is particularly well suited for the modular system architecture of the AdComNet solution from D+H. The headquarters of DNB Bank is part of the spectacular new Barcode Cluster district between Oslo's port and railway station. The building, completed in 2013, was designed by renowned Dutch architectural bureau MVRDV from Rotterdam. The AdComNet solution was implemented by D+H Sweden. Depending on how the room is used, central units networked using AdComNet enable a wide variety of scenarios for opening and closing the numerous windows. In case of fire, the windows in the affected part of the room are opened immediately, allowing smoke to escape. At the same time, other windows are closed to prevent the smoke from getting into other areas of the building. AdComNet consists of various hardware components and a user-friendly operating software program. The system combines all the functions related to smoke extraction and ventilation and reliably implements the necessary control and regulation processes. Digital window automation in the Glucksman Library with AdComBus. The Glucksman Library is Ireland's most modern library and one of the most digitally advanced in the world. The window automation system implemented by D+H completes the high-tech overall concept. The RKD Architects designed the Glucksman Library, which was completed in 2018. The window automation was implemented by the Irish D+H partner Window & Door Accessories. The D+H partner has integrated a large number of CDC-ACB 24 V chain drives in this project, which are controlled directly by the building management system via Modbus. Thanks to ACB technology, the operators of the building can control each window individually or in groups to the exact percentage. The opening and closing speeds of the drives can also be operated individually. In reading and learning areas, for example, they drive up extra slowly and quietly so as not to disturb the students' concentration. The newly-developed Advanced Communication Bus (ACB) from D+H has revolutionised communication between window control systems and drives. Especially during major projects, building operators are often faced with the question, ""Are all of my connections working? And if not, where is the problem?"" ACB allows the drives to communicate with the control systems and gives them feedback about their opening widths and conditions. But this is just one major advantage of the innovative bus technology. It also significantly reduces wiring effort, reducing installation effort and costs, and makes it possible to specify control of the drives down to the millimetre. We discussed the new solution with Christian Kluge, Director of Development at D+H Mechatronic AG, and Steffen Lanfersiek, Team Lead for Product Management at D+H Mechatronic AG. What was the motivation behind developing the ACB? Steffen Lanfersiek: Our greatest incentive in creating the ACB was to optimise the functionality, flexibility and cost-effectiveness of SHEV control systems. In close collaboration with experienced technical experts, we spent many months working intensively on the development and taking on the exciting challenge of elevating communication between drives and control panels to the next stage. The status quo on the market was that the systems which most providers had available only allowed communication using the polarity of the output voltage only in one direction: from the control panel to the drives. Our goal here was to make the drives talk to the control panel as well. They should be able to give the control panel feedback – without extra wiring! We needed to create a technology that both reduced the size of our control panels (because no building operator likes large control cabinets) and featured higher performance capacity. The goal was for the ACB to be compatible with the conventional polarity change standard while also offering considerable functional advantages when combined with D+H drives and control panels. How long has the ACB been available and what functions does it feature? Christian Kluge: We launched the ACB technology in 2016 along with the digital, fully modular CPS-M smoke vent control panel. Compared to the plug-in control panel technology, the CPS-M requires less than half as much space. One reason for this is that each module has two group connections as opposed to just one, and the design of the modules is significantly more compact than the plug-in units. Another reason is that the Advanced Communication Bus connects the drives to the control panel using only one group connection and one cable. Using conventional technology required laying an additional cable and using an additional group plug-in unit for every window that was supposed to be separately controlled. Reducing cable routing and cutting down on the number of modules provides a major cost advantage for our customers. In terms of drives, the CDC-ACB chain drive and the ZA-ACB rack and pinion drive are equipped with the new technology. Other D+H drive models are already being converted. Thanks to improved communication, the window drives no longer just receive instructions from the control panel. They also return information to the CPS-M about their conditions, connections and positions. In addition, each individual drive can now be moved to an individualised position. This is called bidirectional communication, and it provides the user with more functions while also making it easier to carry out maintenance work because it is significantly easier to read out information from the drives. Using the ACB, this communication can be easily configured through the controller. Using conventional technology, this had to be carried out directly on the window drive. This was usually complicated because the drives are installed in areas of the building that are difficult to reach. What added value does the ACB offer compared to other bus solutions? Steffen Lanfersiek: There are comparable technologies on the market that involve controlling drives from a control panel over a bus. These technologies differ greatly depending on the manufacturer. However, I see them all as having one thing in common: Drive synchronisation and communication with the control panel take place over the same bus. In developing the ACB, we made a conscious effort to separate these two aspects from each other. Doing so has safety advantages and also allows us to individually control multiple synchronous groups on one ACB section. As far as I know, this is something that no other provider offers. Using conventional solutions here would mean either that only one synchronous group can be controlled on a group connection or that a separate bus cable must be laid and each synchronised group requires an additional bus coupler. Our solution includes the bus coupler right in the drives themselves. This way, 20 single drives can be controlled using one ACB section for SHEV and as many as 32 single drives for natural ventilation. Our ACB solution also makes us the only supplier to rely on an open protocol standard. This results in an entirely new field of application. As an example, building automation can directly control our drives each individually and with perfect positioning for ventilation purposes. Describe the ACB in a little more detail. What is the technical structure? Christian Kluge: Generally speaking, the term ""bus"" in information technology refers to a system for transmitting data between multiple nodes in a network using a shared transmission path. The most important nodes in a SHEV and ventilation network are, in most cases, a building management system, the window drives and the control panels. Protocols are used as transmission paths in order to meet the requirements for system-internal, secure and stable communication. For the Advanced Communication Bus, this is based on the conventional Modbus RTU protocol. Why conventional? Over time, a wide variety of transmission systems have been developed by various manufacturers. On an international level, though, only some of these systems meet recognised standards. Modbus RTU is one of the protocols that meets international standards, qualifying it as an vital component within industrial communication. We have made our command set public in the ACB manual so that any building automation specialist or technical planner can control the drives directly as well. Now regarding the structure of the ACB: We need a cable with four wires for connecting ACB drives. Two wires handle the power supply and the other two handle communication. As usual, this allows wiring to be guided through all drives in series. Another advantage of the ACB is worth mentioning here. This design does away with simple cable monitoring. Instead, each drive or drive group is monitored directly, providing an additional degree of security. Now, a fault is reported, for example, if a drive cannot open a window due to mechanical problems and an overload is detected. Example: What advantages does ACB have in the new ZA-ACB rack and pinion drive? Steffen Lanfersiek: The D+H rack and pinion drive has been and continues to be the perfect solution for the roof area. 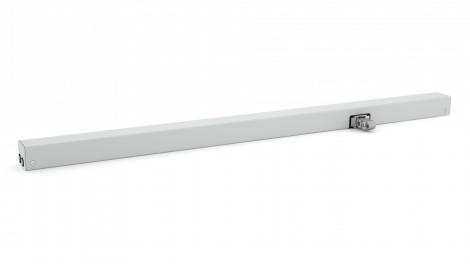 Equipped with a rugged rack and pinion, it has high pressure stability, allowing it to drive heavy flaps, skylights and windows without any difficulty. Of course, the recent addition of the ACB to the drive's equipment does not change this feature. The ACB simply makes the drive intelligent as well as powerful. It is very easy to identify the advantages of the LA-ACB, one of the many variations of the ZA that was designed specifically for louvre windows. In particular, having control down to the millimetre plays a major role here. In the summer, do you want the louvres to create a small gap by opening up only 12.9 percent of the way? Or would you rather have an 80 percent opening for a strong breeze to air out the building? To ensure the ability to implement this control with perfect positioning, the conventional rack and pinion drive used to require a wide variety of additional plug-in units and control panels. Today, all you need is a system consisting of the CPS-M and the ACB-capable drives. 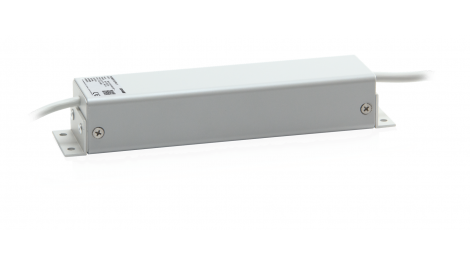 This, along with the ability to connect drive groups using just one connection and one cable, creates tremendous cost advantages for the customer, especially in the roof area. Installation also becomes much simpler. Another example can be used to highlight the advantage of the function that allows you to control the drives within a group individually. Imagine, for instance, multiple offices along a façade with windows that open when using SHEV but are to be controlled individually for ventilation purposes. In the past, this set-up required a group connection at the control panel and separate wiring for each drive. Thankfully, the ACB, along with a concept called virtual grouping, make this complicated scenario a thing of the past. Just one group connection and one cable are needed for all offices. What is the difference between ACB and AdComNet? Christian Kluge: AdComNet (ACN) is the first SHEV bus system certified by VdS. This technology allows SHEV controllers to be combined to form one secure and overarching system. The controllers are linked in such a way that, complex scenarios can be configured relative to the use of a space, i.e. individualised smoke compartments for opening and closing windows. The ACB, on the other hand, controls communication between control systems and drives instead of between control systems. The Advanced Communication Bus should therefore be understood as an enhancement to AdComNet. If you read out an AdComNet network with our user-friendly SCS configuration software—this can be carried out from any point in the network—all control systems and their connections are displayed. If there are control systems with ACB drives in the network, these are automatically indicated. This means that you can now select an ACB drive directly from this view and configure different parameters, such as selecting a different force value. 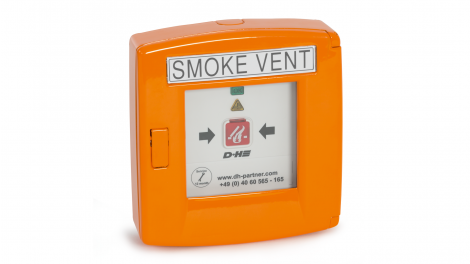 In addition, the ACB drives can be assigned easily to ventilation zones and smoke compartments. This means that we have created a unified and comprehensive system featuring innumerable functions and easy operation simultaneously. As early as the development stage of AdComNet, the overall goal was to create a system so simple that you could operate it without being a trained system integrator. This aspect of our systems clearly separates them from systems such as LON or KNX. The point of our technology is not to be an additional building automation bus but to clearly define the boundaries between SHEV and ventilation. The connection of an AdComNet system to a higher-level building automation system is possible over an easily configurable gateway. However, the ACB can also be controlled directly by a building automation system because it is based on Modbus.